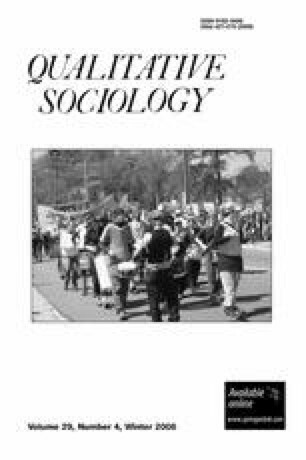 Focusing on the interactional dynamics of movements, we find that two constructs, voice and agency are critical to the development of a sense of “groupness” and can aid social movement actors in accomplishing desired goals. Voice and agency are accomplished when movement actors engage in various processes such as planning and strategizing, completion of goal-oriented tasks and other unifying activities. We examine four social movement organizations operating in separate movement contexts with different outcomes: contested gay politics in Cincinnati, Ohio and grassroots feminism in Cleveland, Ohio and New York City, New York. We find that groups will have a better chance at achieving their goals if members are able to create a unified voice, and if leaders include and draw from the strengths of those they recruit, thus allowing a sense of agency. Kimberly Dugan is an Associate Professor at Eastern Connecticut State University and author of The Struggle over Gay, Lesbian, and Bisexual Rights: Facing Off in Cincinnati (Routledge). Her current research focuses on social movement activism and GLBT individual and family rights legislation. Jo Reger is an Associate Professor of Sociology and the Director of Women's Studies at Oakland University in Michigan. She edited the book Different Wavelengths: Studies of the Contemporary Women's Movement (Routledge) and has authored several articles about the National Organization for Women and contemporary feminism. Her current research examines the continuity of U.S. feminism. We have listed our names in alphabetical order and are full co-authors. We wish to thank Mary Bernstein, Rachel Einwohner, Mara Lieberman, Margaret Martin, and Nancy Whittier.